As the sun begins to shine longer each day, and our clocks spring forward, the energy changes at my house. My boys want to spend every minute outside in shorts, even when it’s blustery. Well, this past weekend, we tried to let them fulfill that desire. And although they were not in shorts the whole time, their celebratory attitudes were not hampered one bit. We all had a great time soaking up the sun and enjoying the warmer weather. Seems like with spring just around the corner, parties are happening everywhere. Ozuké pickled things is participating in the Party Against Poverty at the Belmar Whole Foods Market, Saturday, March 30th. The festivities are from 12-4pm and include, beer, brats, kraut, and music! Whole Foods is partnering with The Friendship Bridge to support the Whole Planet Foundation, a nonprofit dedicated to alleviating poverty through microcredit in communities throughout the United States and around the world. Local brewery, Avery Brewing Company will be pouring beers. Come and eat delicious foods to support a great cause. In anticipation of this festive event, I fired up my grill (well, Joe did, but I used it), and prepared a savory sausage dish. 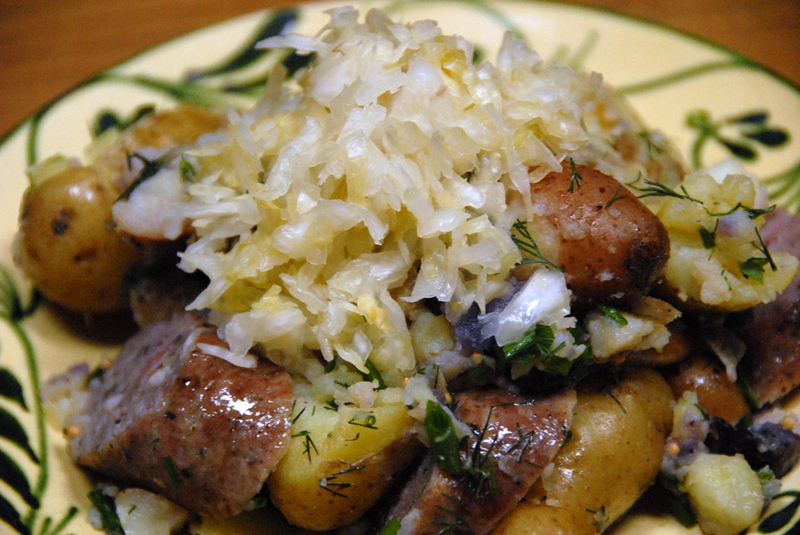 There is something so perfect about grilled meats with GREAT kraut. This simple recipe epitomizes that hearty combination. The best part is that is takes less than 30 minutes to prepare. Place potatoes in a large pot. Add water to cover by at least 1″; salt water generously. Bring to a boil over medium-high heat; immediately reduce to a low simmer until potatoes are tender, about 18 minutes. Drain potatoes, reserving 1/2 cup cooking liquid. Meanwhile, boil beer brats for approx. 8 minutes, and then transfer to hot grill until lightly charred on both sides, about 2 minutes (each side). Let sausage cool (or not if you are in a hurry). Cut sausage into 1/2″ diagonal slices. Combine potatoes, butter, mustard, and 3 Tbsp. potato cooking liquid in a large bowl. Toss, adding cooking liquid by teaspoonfuls as needed, until butter lightly coats potatoes with a glossy sauce. Season potatoes to taste with salt and pepper. Using a potato masher, lightly crush the potatoes (you want them to just break open but not fall apart). Add sausage, 3 Tbsp. dill, and chives. Serve with a few tablespoons of ozuké the best pickled things Just Juniper for a crisp topping. 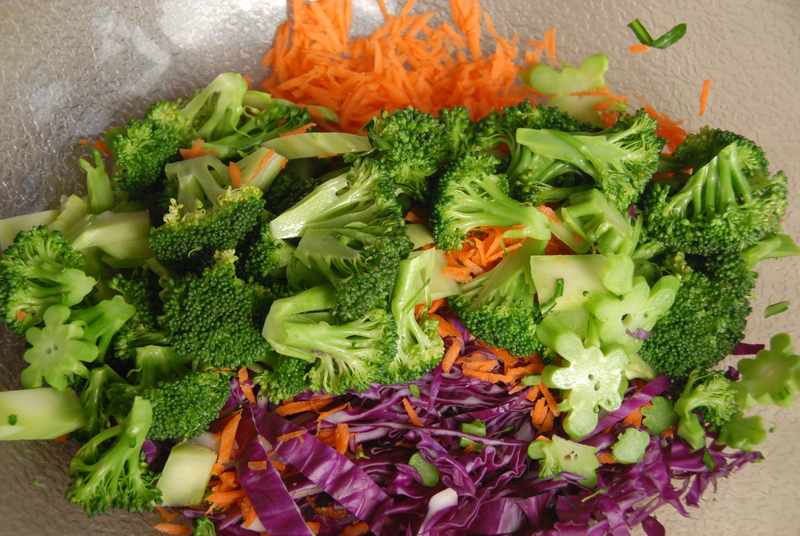 To go with the potatoes, brats & kraut, I prepared a broccoli salad. 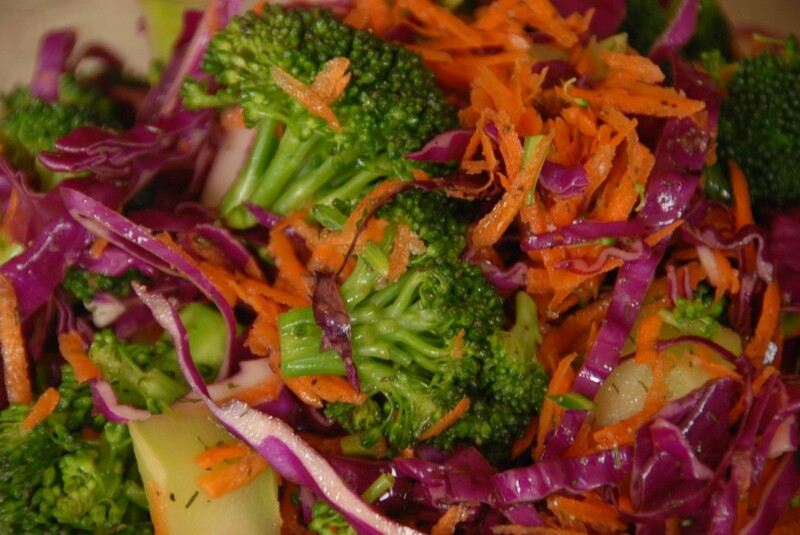 This salad can be made ahead of time, and stored in the refrigerator for up to 2 days. Toss all ingredients together and serve. Can make ahead and store in refrigerator. What types of grilled foods do you enjoy with ozuké pickled things? Share your combination ideas with us or send us your recipes. We’d love to try them. The broccoli, red cabbage, & carrot salad is incredibly delicious, not to mention, a beautiful & colorful addition to the table & plate. I had it as a side dish the other night—thank you, Mignon! I will be making it on a regular basis. Can’t wait to try your Zuke recipes also! Searched for a jar of the “just juniper” only to find one with a best by date only 1 day later than the day I was buying it. I’ve heard the “best by” date is actually much longer than what is put onto the jars…can you confirm? The best buy date is simply a recommendation we base on our preferred tastes and textures. In fact, fermented foods are delicious and can be consumed over a longer time. 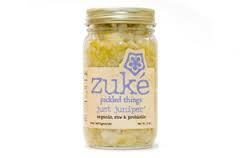 We have just recently extended zuké pickled things best buy date to a 9 month period. Typically, the krauts & beets get a bit softer as they ferment longer. Overtime, the beets start to develop a delicious juice. I personally like our krauts, kimchi, & beets on the crunchier side (younger). All of the products usually become more effervescent as they mature as well. Those increased bubbles mean your favorite zuké pickled things is live and rich in probiotics. This translates to increased digestive system support. Enjoy your jar of Just Juniper as long as you like the flavor & texture.